College DownTime: Become an Ordained Minister - For Free! You remember the big 2000-era hype of eChurches? Well they are still around and just as legitimate as ever. 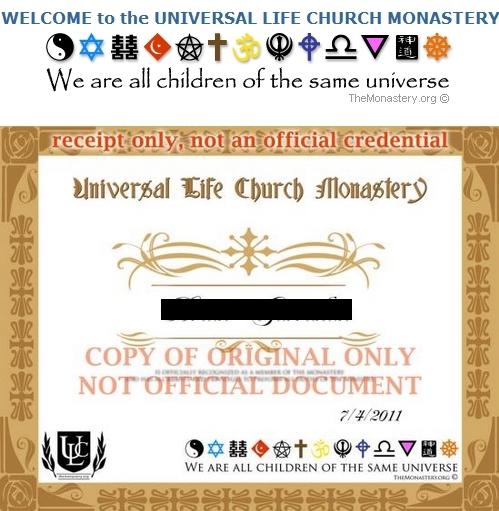 Today's post will teach you how to become an actual, legitimately ordained minister, pastor, or priest. It only takes a couple minutes and could possibly be an extra source of income, depending on how far you want to go with it. 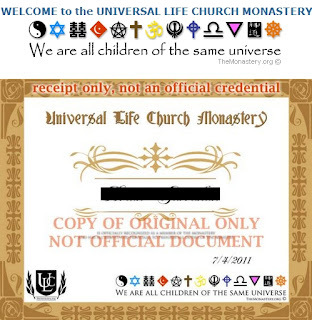 1) Head over to The Monastery, American Fellowship Church, or Spiritual Humanism, and click Free Online Ordination. These are the ones I found are free. 2) Look over the statement (pfft, ha!) and click Begin! 3) You have to fill in your basic signing-up form information and the submit. 4) Look for your confirmation email and print it out. I keep mine taped to the mirror, to remind myself I can become anything I put my mind to. After doing all that, they have reminders for you. Typical items like their mission statement, tenets, wedding ceremony info, and even your very own HTML code to put onto your site! Unfortunately, if you really want to become a licensed wedding-making-person, you will have to have a physical token that shows you are ordained. Their wallet-sized ordination card fits in your wallet and is enough proof for most licensing applications. Plus, you can whip it out any time "by the power invested in me..." jokes are relevant. Choose your joke timings carefully as it could become predictable. Learn how to lead into the joke slyly to show off your ordination certificate. You will have to look up your state's wedding license requirements if you want to keep going with this program. We at College DownTime have it fairly easy in Nevada. Our state's law only asks us to be ordained, be 18+, and pay a $50 license fee! Some states are much harder and expensive, so good luck y'all. This entry was posted on October 4, 2009 at 12:14 pm, and is filed under church, computer, make money . Follow any responses to this post through RSS. You can leave a response, or trackback from your own site. Haha, this is mad. Is it valid in Ireland? I wanna marry my dogs. I mean to each other. Not to me. No idea if Irish law prohibits it, but each of those online churches are international/interfaithful/interracial (if you're into that). Thanks for sharing this. I did not know something like this was around until my friend told me he went through an online ordination to perform his sister's wedding ceremony. I think it is a very good platform.